Das CFM100 speichert Daten auf einer CompactFlash® (CF)-Karte. Dadurch kann der speicher des Loggers auf bis zu 16 GB erweitert werden, die Daten können auf der Karte einfach entnommen und transportiert werden. Das Modul wird am Peripherieport des CR1000 oder CR3000 angeschlossen. The CFM100 includes a card slot that can fit one Type I or Type II CF card. Only industrial-grade CF cards should be used with our products. Although consumer-grade cards cost less than industrial-grade cards, the consumer-grade cards are more susceptible to failure resulting in both the loss of the card and its stored data. Industrial-grade cards also function over wider temperature ranges and have longer life spans than consumer-grade cards. Data stored on the card can be retrieved either by removing the card and carrying it to a computer or through a communications link with the datalogger. The computer can read the CF card either with the computer’s PCMCIA slot and the CF1 adapter or the computer’s USB port and the 17752 Reader/Writer. CardConvert is used to convert and save binary data from a CompactFlash card. CardConvert is included in our PC200W, PC400, LoggerNet, and RTDAQ datalogger support software. The CR1000 OS must be OS 4 or later. Both the CR1000 and CR3000 need OS 25 or later to read cards with more than 2 GB of storage. ENC10/12 Compatible when attached to the CR1000. The CFM100 is compatible with the CR3000 using the -NB option (base with no battery). ENC12/14 Compatible when attached to the CR1000 or CR3000. ENC14/16 Compatible when attached to the CR1000 or CR3000. ENC16/18 Compatible when attached to the CR1000 or CR3000. Campbell Scientific offers and recommends several CF cards (see Ordering tab). These cards have passed Campbell Scientific's ESD testing and operate properly with our dataloggers. Only industrial-grade CF card should be used with our products. Although consumer-grade cards cost less than industrial-grade cards, the consumer-grade cards are more susceptible to failure resulting in both the loss of the card and its stored data. Industrial-grade cards also function over wider temperature ranges and have longer life spans than consumer-grade cards. Data stored on the card can be retrieved either through a communications link with the datalogger or by removing the card and carrying it to a computer. The computer can read the CF card either with the computer's PCMCIA slot and the CF1 adapter or the computer's USB port and the 17752 Reader/Writer. The CFM100 fastens onto the datalogger's 40-pin peripheral port. This means that the CFM100 is only compatible with the CR1000 and CR3000. It is NOT compatible with the CR800, CR850, CR200X, CR5000, or CR9000X dataloggers. To read cards with more than 2 GB of storage, the datalogger operating system must be OS 25 or later. Is it possible to report CFM100 diagnostics in hourly transmissions so that any issues are detected promptly? The CFM100 does not have any diagnostics that can be reported. The Status table does report the status of the CompactFlash card and the number of bytes free on the CF card. When is a file on the card of a CFM100 or NL115 open? The file on the card is open until the program is stopped or the button on the device is pressed. Does anything special need to be done in LoggerNet to retrieve data from the memory card in the CFM100? LoggerNet collects data from the datalogger first. If there is additional data on a CompactFlash card, LoggerNet collects that also. Nothing special needs to be set up in LoggerNet to have this occur. Is it OK to insert a CompactFlash card that has old data on it into a CFM100 or NL115? Do CF cards always have to be reformatted or completely erased before inserting them into a device? The best practice is to format the CF card, not using “Quick Format” on a PC, before inserting it into a device. How can data from a CompactFlash card be stored in several files so that each day has a new file? Review the CRBasic Editor Help for information on the TableFile() instruction. What might cause the inability to transfer data from a datalogger to a memory card? If the CardOut() or TableFile() instructions are configured as fill and stop, the datalogger will stop writing data to the CompactFlash cards after they are full. Could a recent OS upgrade cause data to continue to store on a CR1000 or CR3000 but no longer store on the CompactFlash card of a CFM100 or an NL115? No. Only a program change could cause this. To save data to a CFM100 or an NL115, a CardOut() or TableFile() instruction must be present in at least one data table. Why would a CompactFlash card that works fine in cameras and computer drives not work in a CFM100 or NL115? For detailed information, review the information in the “CF Card Information” application note. Why would disconnecting and reconnecting a CFM100 or NL115 make a datalogger unable to detect the device? The CFM100 or NL115 is detected during the datalogger boot-up cycle, that is, when it is powered on. Disconnect or connect the CFM100 or NL115 to a datalogger only after power to the datalogger has been disconnected. Can any type of CompactFlash card be used with a CFM100 or NL115? 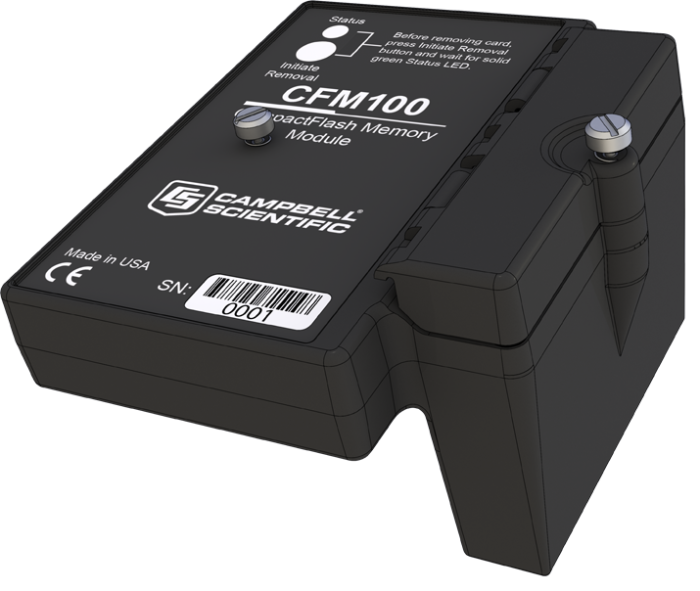 Campbell Scientific always recommends using CF cards carried by Campbell Scientific. Although another CF card might fit and work with a CFM100 or NL115, the CF card might not be rated for the same temperature range as the CFM100 or NL115. In addition, another CF card might not have the same electrostatic discharge (ESD) immunity as the cards tested and carried by Campbell Scientific. For more detail on CF cards, see the “CF Card Information” application note.